The pull-out storage system provides great possibilities for space-saving storage of clothing and accessories in wardrobes. Convenient stacking and removal are made possible by pull-out storage elements. The basic concept: A series of pull-out frames with full extension can be adapted to many different interior cabinet widths. 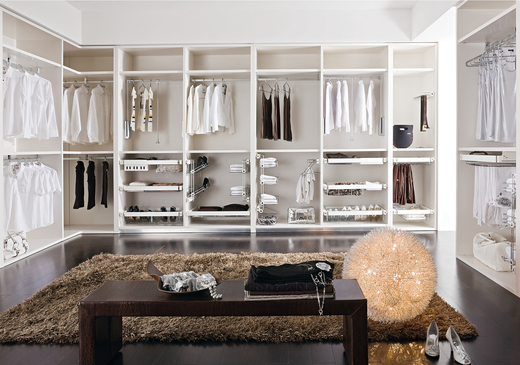 Many different combinations of wooden, steel or plastic storage elements can be hooked onto the frames. The pull-out frame is easy to assemble and fixed with grub screws. The design allows individual assembly of different widths. The pull-out frames are screwed to the side panel at 32 mm intervals. 3.5 mm chipboard screws can also be used for attachment. The storage elements are hooked into the pull-out frames with plastic clips. Please take care not to exceed the usable width when subdividing the pull-out frame. The installation height varies depending on the storage elements that are used. Please refer to the products for further information.